I have missed too many painting shows already this year. 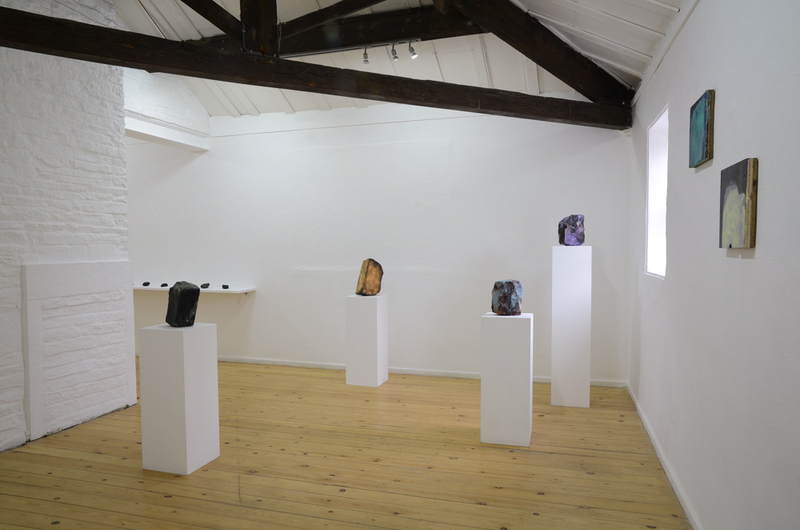 One that I would have loved to see, but just couldn’t get my calendar to co-coincide with, was Geode, an exhibition of paintings by Lisa Denyer, at South Square. Often quite ‘formless’, especially compared to her earlier geometric paintings, Denyer’s recent paintings are like gaseous non-substances, diaphanous veils, pure illusion, immaterial yet at the same time exulting in materiality. The contradiction puts me in mind of Clement Greenberg and Michael Fried’s enthusiasm for “flatness and its delineation” being simultaneously an insistence on “opticality”, prompting the distinction between, and the ‘holding in tension’ of, image and object[i]. I find this tension in Denyer’s paintings, which is not to suggest that she is committed to the Greenbergian position that was so influential for abstract painters in the latter half of the twentieth century. In fact, working against the visual modality, or opticality, is a clear interest in surface texture, which provokes at least an imagined crossover from visual to kinaesthetic perception. So when she’s working on found plywood, it’s the rough-and-readiness of the surface that is enhanced by the application of thin layers of liquid paint that adheres to the crevices amplifying the texture. There’s also an emphasis on the engagement of the viewer that Fried might have objected to, no doubt labelling it “theatricality”. 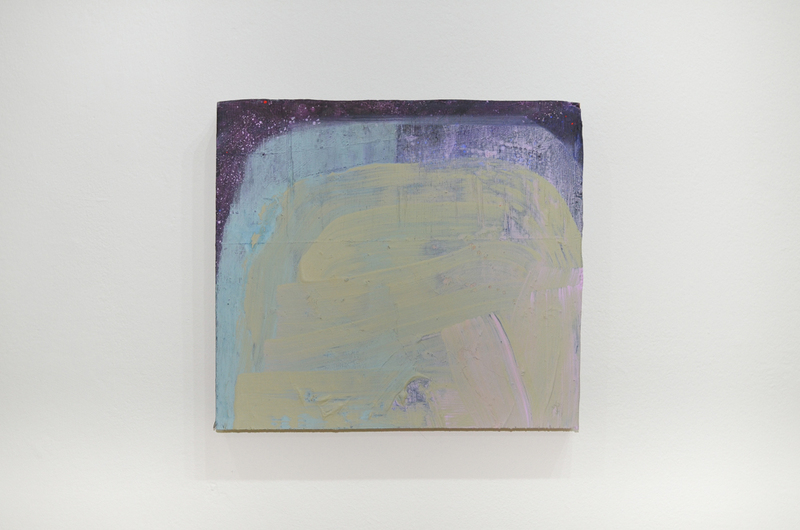 The subjective participation of the viewer ‘completes’ these paintings in a fashion akin to the action of gazing into a fire and seeing one’s own imagined universe, or if not the universe, certainly the milky way, Denyer’s art so often resembling the night sky. The two dimensional paintings, usually on plywood, look like they were factured on the horizontal, either on the floor or on a table, and the images, in so far as they are images at all, look less composed than arrived at through operational processes. Leo Steinberg’s “flatbed picture plane” comes to mind. And it seems a natural step from these works to the three dimensional paintings on stone, which I do think of much more as paintings than as sculptures. 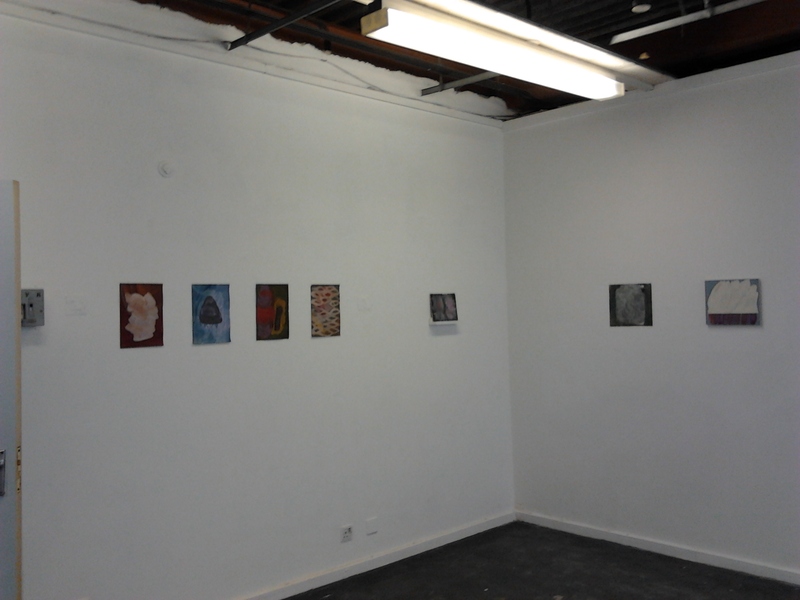 Geode, Installation view. Image by courtesy of the artist. Like the works on plywood, these paintings also explore surface texture, both affirming and denying it, attempting perhaps to bring out the hidden qualities of the stone, as if the crevices, geode like, are lined with minerals or crystals. That the inherent qualities of the stone are highlighted reminds me of Michelangelo’s prisoners, where figures emerges from rocks “as though surfacing from a pool of water”. But there is nothing figural here, it’s more like space itself is surfaced, having been developed from something latent within the object, as opposed to having been imposed upon the object. 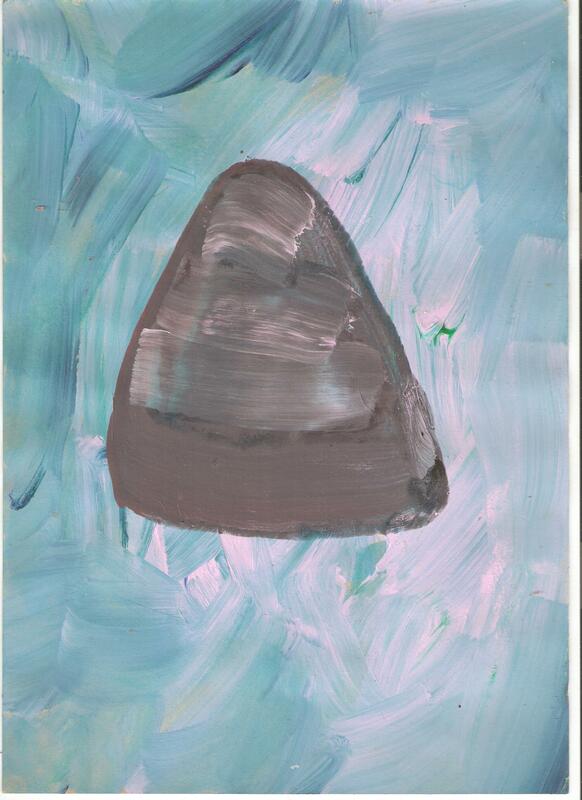 In this respect we could make a contrast with Kurt Schwitters’ Painted Stone, where a geometric pattern looks more to have been inscribed onto the rock from without. 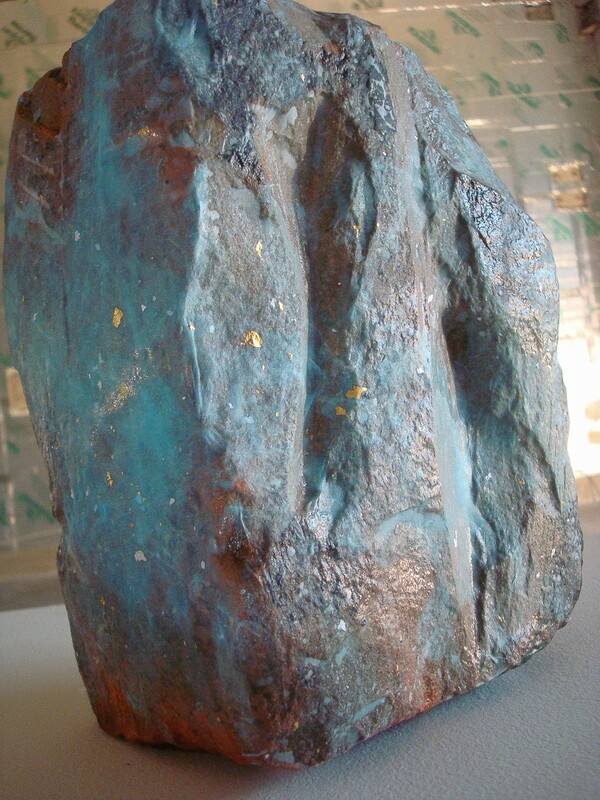 Denyer’s stones are rescued from local derelict buildings, ready-mades, years ago having been quarried, dressed and built, only then to become weathered and eventually falling into collapse or demolition, almost returning to their natural state, before she reclaims them, transforming them into giant synthetic gems. Whether on plywood or stone, Denyer’s paintings have this gemlike quality as if by some alchemy she transforms her materials into precious metals, once liquid now gemstone, that when gazed into appear to contain the night sky. 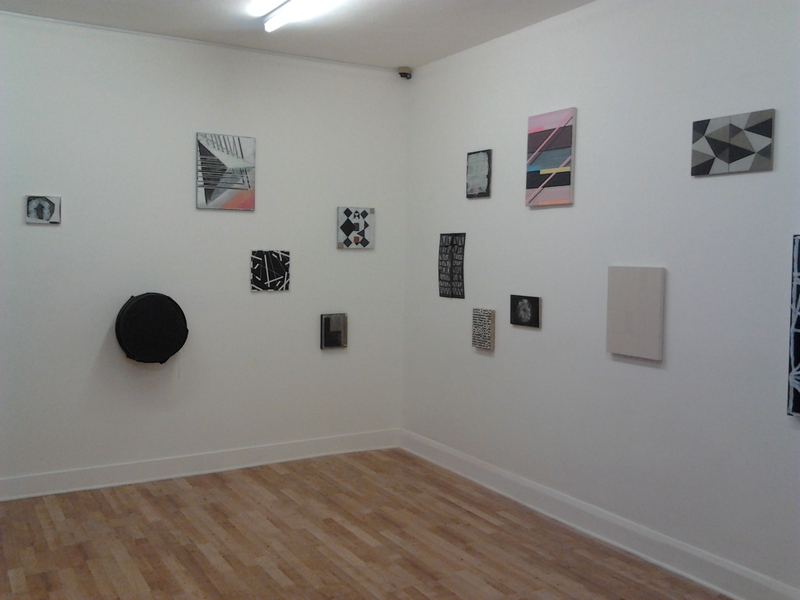 I posted recently about the excellent exhibition Meditations curated by Lisa Denyer and Matthew Macaulay at Pluspace, Coventry, showing paintings by Karl Bielik, Lisa Denyer, Rachael Macarthur, Matthew Macaulay, Sarah McNulty, Phoebe Mitchell, Joe Packer and Melanie Russell, on until 7 July. I said little then about four charming paintings on paper by Rachael Macarthur, and I cannot resist returning now to say more about them. On entering the gallery space it is Macarthur’s paintings that I come to first, and to begin with I don’t really know what to make of them. Mostly I perceive them as figure on a ground paintings, particularly the first two, Tabula Rasa and Voyages Grand, but also to a lesser degree the others, and whilst I find the overall colour of each piece attractive, there is something about the figures that I find, if not ugly, then certainly awkward. Is it perhaps that they seem inchoate or even malformed? As I get into a conversation with myself about what they are I realise that I am enjoying them a lot, and it occurs to me that the slight awkwardness prevents them from veering into the territory of the “merely decorative”. They could be experiments in form, the drawing looking like it came from the inside out, as if the shapes evolved from within the painting process rather than being imposed from the outside by the artist’s hand. 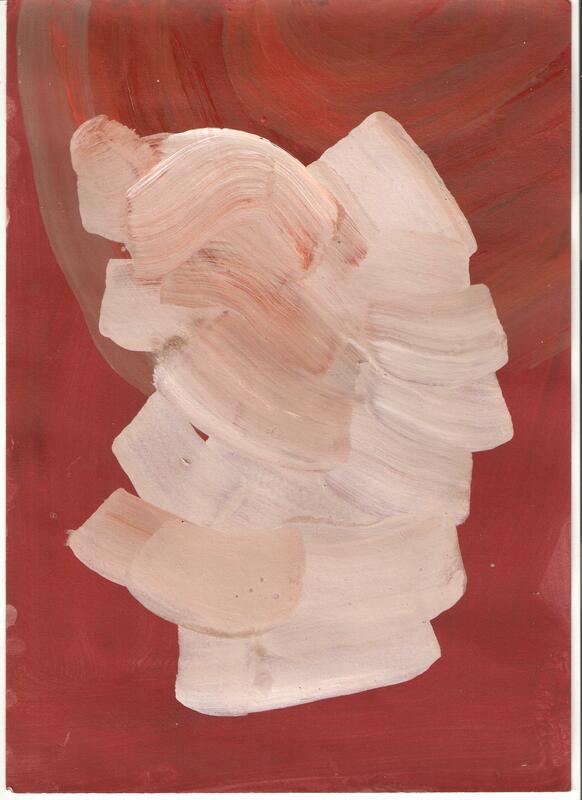 Tabula Rasa, looks like a red/terracotta ground was laid down first and then an image was allowed to generate itself almost unconsciously by applying brushstrokes, lighter in tone than the ground and in impasto, towards the centre of the paper, resulting in an abstract portrait. It could be a head in ¾ view. I can imagine the artist working, holding the paper in one hand and painting with the other, or perhaps resting the paper on the floor or a table and rotating it as she works. Believing I can see finger prints along the left hand edge reinforces this imagined scenario. The painting is audaciously simple, yet any more work on it would be too much, it would become something else, and the purity of the image would be lost. Similarly, to transcribe it into paint on canvas or into a larger scale would be to lose the spontaneity and directness that seems to come so easily in this format. …except that it is so self evidently paint, no effort being made to specifically describe sea or sky. The association is in the colour and perhaps in the way the light shines through it like sunlight from behind storm clouds. In comparison with Tabula Rasa the central shape, also made up of impasto brush strokes, this time in grey, and concentric, whereas it is eccentric in Tabular Rasa, appears to float. Both of these are pictures, yet it is unclear what specifically they are pictures of, and I think it is the attempt to work them out that both gives pleasure to the viewer and at the same time creates a certain amount of discomfort. It’s a bit like waking from a dream and vainly trying to recall it. Parts of it come back for a moment and then are gone again. Or to stretch the analogy further I could say that attempting to make sense of these pictures is like attempting to interpret a dream. Gregory Bateson describes dreams as “bits and pieces of the stuff of which we are made. The non-objective stuff” pointing out that “the dream contains no label to tell us what it is about” likening it to “an old manuscript or letter that has lost its beginning and end, and the historian has to guess what it’s all about and who wrote it and when – from inside it”. In this sense I think these pictures have a dream like quality and didn’t Freud identify dreams as “the royal road to the unconscious”? The third painting Keep Your Shadow is arguably more complex than the first two, in that the one central figure is replaced with a cluster of figures and there is overlapping and containing of figures one over another or one within another. The figures seem to be the result of applied colours being allowed to find their own boundaries rather than drawing shapes that are then “coloured in”. In both Keep Your Shadow and Split Mimic, there is more ambiguity between figure and ground than there is in the first two pictures. In Split Mimic an indeterminate green ground, looking more like thin air than solid mass, supports a solid looking ochre “V” at the lower edge. Above it, or rather behind it, a red figure emerges appearing to stand within the space rendered by the green coloured ground. And then in front of everything else a swarm of outlined shapes, or perhaps a school as they are vaguely reminiscent of fish, hovers, seemingly in motion, progressing from left to right. In relation to this picture, it is easier to describe the relationships between the various elements than it is to describe what those elements are, again recalling Bateson on dreams saying that “The dream elaborates on the relationship but does not identify the things that are related.” Aren’t we back in that distinction between process and content? In another of my lives I sometimes lead groups in guided fantasy, and I have learned that this works well when I stay out of content, engaging only in process instructions. For example, if I instruct a group to “in your imagination, find a safe place to rest, paying attention to what you see hear and feel in that safe place” each member of the group will supply their own content. Some people will imagine themselves on a beach in the warm sun, and even then all those beaches will have different features, others will be indoors somewhere and others may imagine themselves in the countryside, the supplied content differing with each individual. If I make the mistake of indulging in content the experience will be impaired. Say in a further instruction I suggest they feel the warmth of the sun, the fantasy will be broken for all those whose safe place was indoors and their experience will be diminished. Of course, in making these parallels I am speaking metaphorically about the experience of looking at these paintings. I am not saying that the same thing is going on, and I am not even sure that my speculation throws any light on the experience, though I do think that, at the risk of lapsing into anti-intellectualism, it has some affinity with the idea expressed in the exhibition notes, of presenting paintings that are supposed to be “meditated on and enjoyed with the senses” rather than understood. 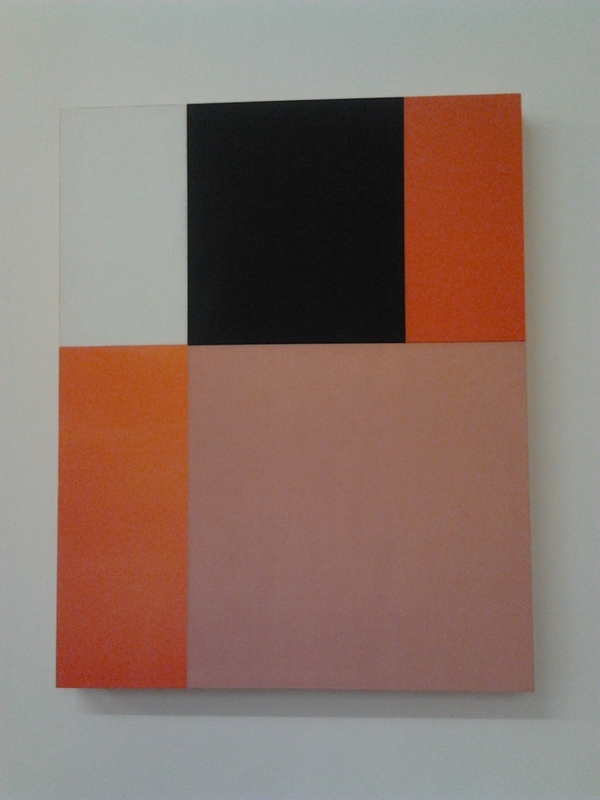 I have, from time to time, complained on this blog about how rare it is to see abstract paintings outside London. Not today! Meditations, a lively show of paintings by eight artists “working within a predominantly non-representational vocabulary”: Karl Bielik, Lisa Denyer, Rachael Macarthur, Matthew Macaulay, Sarah McNulty, Phoebe Mitchell, Joe Packer, Melanie Russell is showing at Pluspace, smack bang in the middle of Coventry city centre. Meditations is a fair title for a show of paintings that are more to be “meditated on” than “reasoned with”, more to be “enjoyed” and “felt with the eye” than “understood”. It could equally have been entitled Experiences or Events as Matthew Macaulay acknowledges in his Collection of Events, a series of oil painting on panels of sometimes slightly differing size or shape and leaned against the wall, mostly in sequence with one panel placed in front of two others partially obscuring them, and one placed partly behind another. Matthew Macaulay, Collection of Events. 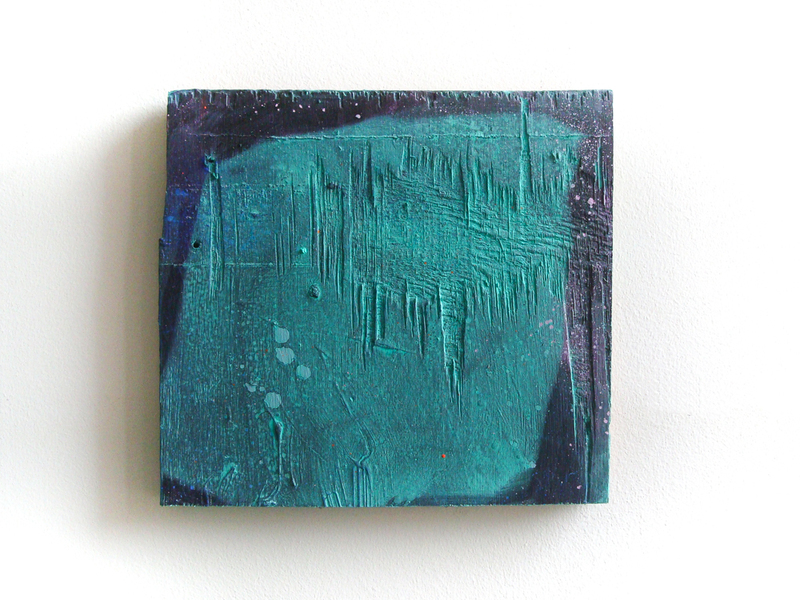 2013, oil on panel, image by courtesy of the artist. I find that I am “reading” the work a panel at a time, from left to right as I would a text, so themes of language and communication come to mind, and then I am recalling that excellent article by Alan Gouk where he disputes the notion (borrowed from Lacan) that painting is “structured like a language”. 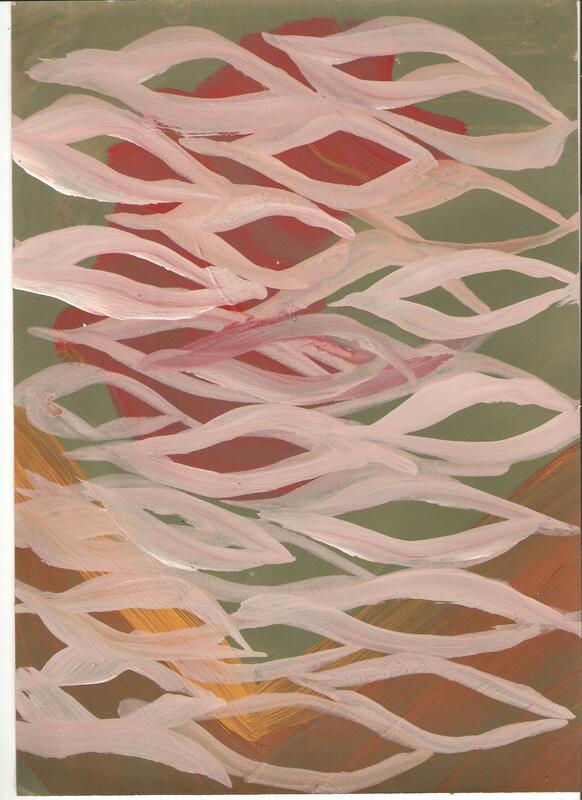 This particular painting may not be structured like a language, but it is structured very much like a sentence. The syntax could be rearranged and it would have a different “meaning”, the word best defined according to the well known systems dictum: “the meaning of a communication is the response you receive, rather than the intention you had for it”. There is something urban about Macaulay’s painting. It reminds me of how a shared space like a city centre, whilst being consciously built, because there are multiple players involved also develops unconsciously, in a way that almost resembles organic growth, evolving and changing. In our conversation, Macaulay emphasises the temporary nature of the gallery/studio space. This temporariness seems to be echoed in both city centre and painting. Many of the shops are empty with whited out windows and even the ways in which the whitening is applied seems to carry through to Macaulay’s painting: gesture and movement becoming object, for contemplation. 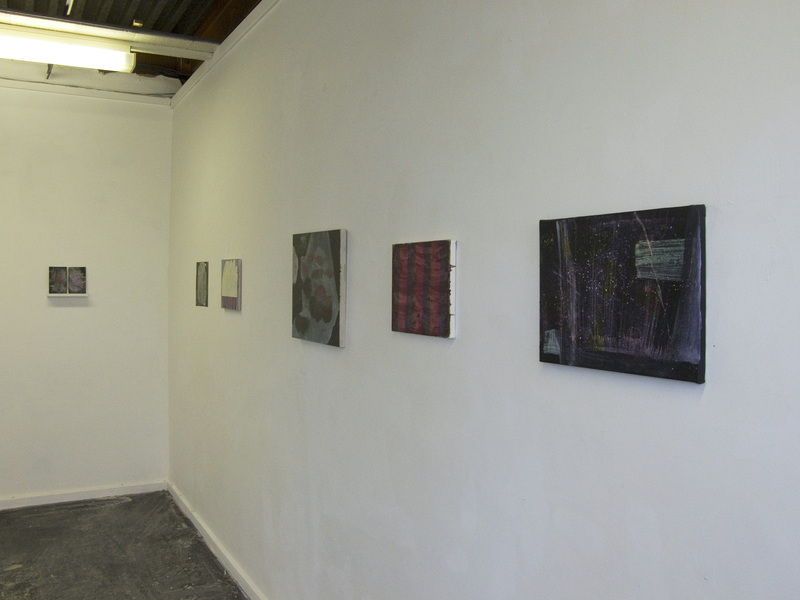 For me, the most meditative of the works here is the tiny diptych by Lisa Denyer, Untitled 2013, (seen far left in the above installation shot), where at normal distance I “feel with my eye”, each panel, as if each one is presented to each of my eyes, such that the negative line of the wall space between them seems to project forward and glow. At least that’s what happens as I view, with a light trance state beginning to develop. 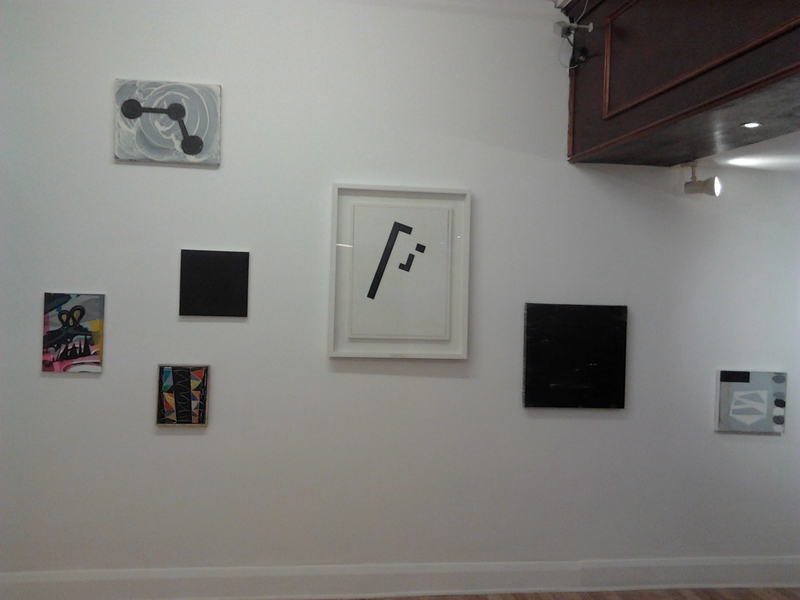 The other painting by Denyer (far right in the installation shot) evokes night time sky and constellations, the dark ground at the lower edge suggesting ground as in ‘floor’, with one undefined colour/form anchored to it on the left hand side whilst another towards the top right appears to float. 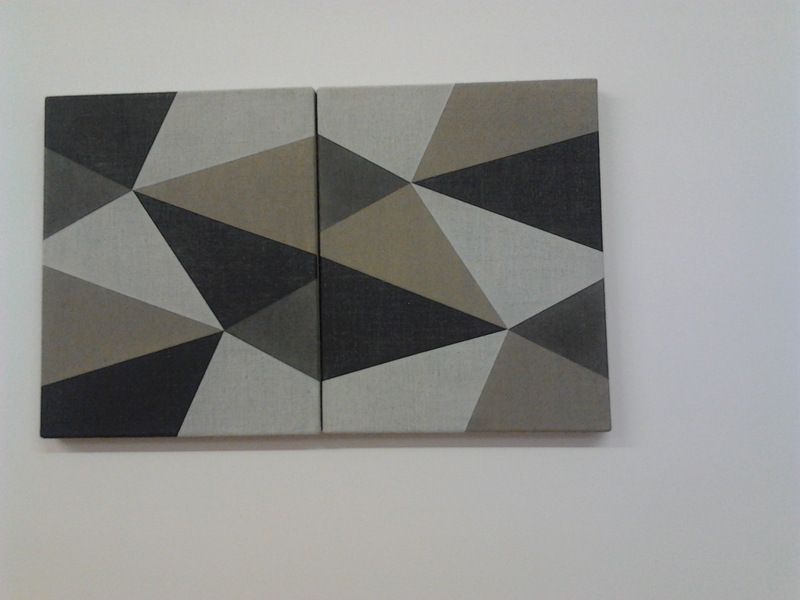 There is more directed accident in these two paintings than in Denyer’s more geometric works, but the landscape associations are a constant. In the three paintings by Melanie Russell, the associations appear to be more about food, they look edible. Macaulay comments that they have some of the attractiveness of a sweet shop and I agree. We mean it only in a good way, but it could be taken to be a bad thing. I am reminded of my own thoughts towards a painting I was working on recently where the support was a chocolate box lid. We used to use the label “chocolate box” to mean sweetly decorative, trivial or sickly. 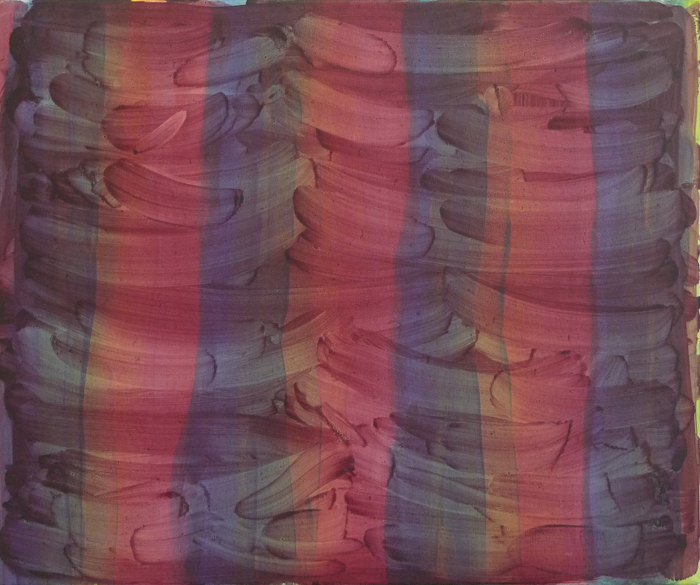 Russell seems to be playing with this in making paintings that are structured like a dessert. Playful they may be, but they are not lacking in seriousness, operating perhaps as visual metaphors for the tension between indulgence and discipline, freedom vs control, unconscious vs conscious, or to use Stephen Gilligan‘s distinction, “essen” (to eat) and “fressen” (to pig out). I wonder if these connect to a further distinction we could make in regard to abstract painting between the analogue and the digital. I think I have in mind something similar to David Sweet‘s “rough finish of 20th century canvases” vs ” the uninterrupted texture of photography and screen based media”. Whilst much of what is on show here seems to relate more to the former than to the latter I could speculatively suggest that there is at play an attempt to integrate the two. Might the title of one of Phoebe Mitchel’s paintings, Smoke Screen, even allude to this: the uninterrupted texture of the screen, itself a product of gestural ‘smoke’? Her Untitled 2013, is even more nearly a monochrome than Smoke Screen, yet is itself comprised of multiple semi-transparent layers of colour. Sarah McNulty’s Green T, also very nearly moves into the territory of the monochrome yet, far from being unmodulated, is made up of circling gestures, similar to the whiting out of shop windows alluded to earlier. Her Portrait II, like Joe Packer’s Vorticist. D. Baby, vaguely resembles a portraiture of sorts, taking me back to the quote with which I started, Hoyland saying that paintings, like people, are to be recognized rather than understood. Rachel Macarthur’s four oil paintings on paper are informal, gestural, arriving-at-form in the process of paint application, and there is gesture and painterly dialogue in the three wonderful paintings by Karl Bielik. Bite has a trio of irregular white triangles that zig zag horizontally across the centre not unlike clothes on a washing line or bunting, their rhythm echoed by other more or less triangular shapes in green above and below, between them creating eccentric negative shapes that push forward, shifting alternately between figure and ground. Spy looks like the support could once have been the lid of an old school desk, the hinges are still attached and the ground might be the distressed varnish upon which I imagine that Bielik has painted his main motif, a series of lozenge shapes in a net formation. I have the sense that I am looking through it to the picture plane and also looking through it to memories of lifting my school desk to create cover for an illicit conversation with a friend. Meditating on paintings can elicit this kind of age regression, bringing to mind memories and associations that may have been long forgotten, and in this evocation of youth, amongst these new abstract paintings (all less than than three years old and most of them made in 2013) I get the impression that abstraction could still be in its infancy, as if Bielik’s Curtains that cleverly close the show also, at the same time suggest future openings. The Lion and Lamb is itself a double vision: a bar and gallery, what a great idea! (in my earlier post I said it was in Shoreditch but actually the postal address puts it in Hoxton). The Lion and Lamb is a unique opportunity for painters to curate painting shows: perhaps visual essays or a kind of platform where artists can examine current practices in painting, take works from their usual contexts and experiment with new juxtapositions. 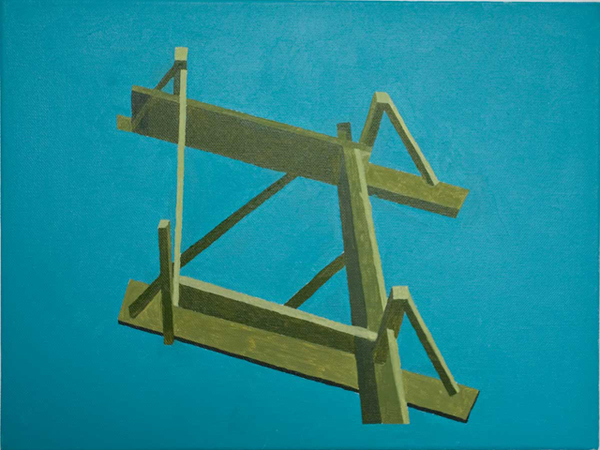 ‘Double Vision’ is the title of the current exhibition, curated by Katrina Blannin and showing until 14 July 2012. 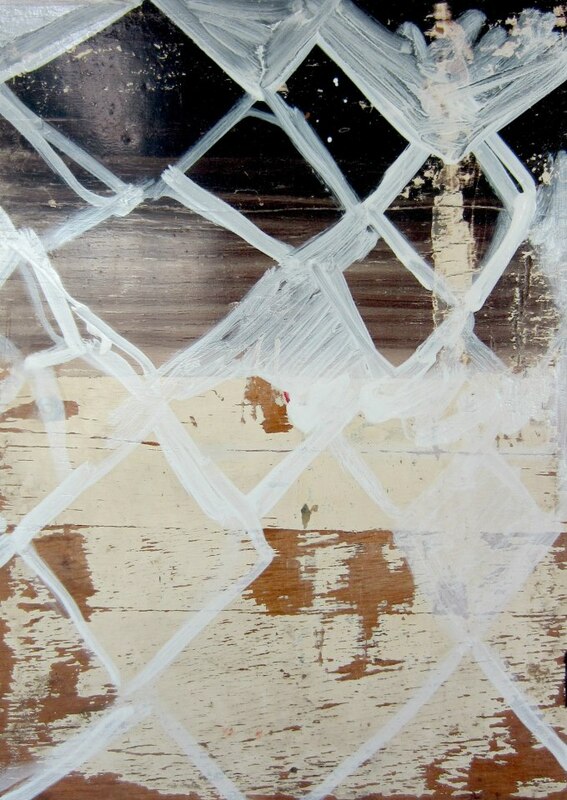 It alludes to “notions of double layering in painting, whether material, compositional or theoretical”. It explores binary oppositions like figure/ground, surface/depth, symmetry/asymmetry and chance/system, oppositions that are, in a sense, combined or held together, which in language might be oxymoronic but in painting seems perfectly natural. I wonder if we might even say that holding together opposites and exploiting ambiguities in relation to them is what abstract painting does best. Although it is a very long time since I read Harold Osborne, I feel sure that one of his arguments was that quality in painting is largely to do with exploiting spatial ambiguity. Maybe because I was looking for the Mali Morris painting it was the first thing I saw as I entered the gallery (with a pint of beer in hand). 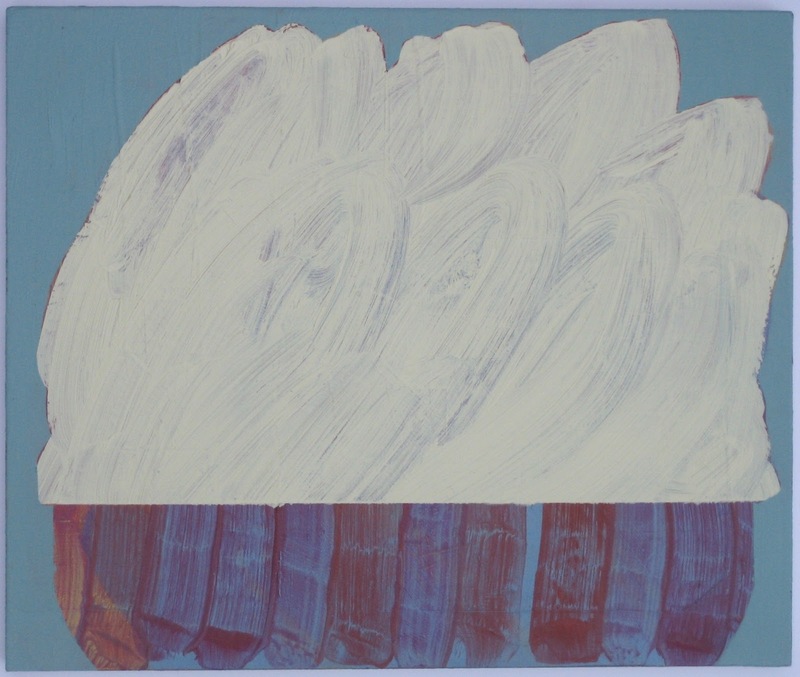 Like many of her recent paintings it is modest in size, but it seems less obviously to do with colour as the paintings she recently showed at Oriel Mostyn Gallery, until you get up close that is, which is quite difficult for me because it is high up and I am only just 5′ 6″ tall. In my memory, but not in this snapshot so now I am wondering how much of my recollection is constructed, colour shines through the multiple layers of ground, and maybe through ‘figure’ too. Was the swirling white ‘ground’ added last, so that the figure is negatively constructed from what might previously have been the ground? That’s the sense I have. Also I think that the black is a layering of colours rather than black paint, though I could be wrong about that. I liked the way the show was hung, but I also wanted something to stand on so I could get a closer look at this one ( I should have asked). Even without entirely getting to answer my “how was it made?” questions the painting starts to work on me. I become fascinated by the layering, the information that seems both hidden and revealed, and by the “figure”, is it one or three? that seems to hover above a vortex, creating an optical space that is in one reading quite deep, and in another entirely flat. Having recently read Katrina Blannin’s interview with Jeffrey Steele in Turps Banana (Issue 11), where there was also a little reproduction of her painting Pink, I was keen to see some of her work “in the flesh” and the painting here, a diptych, was a delight. The “systems” connection is clear, and she seems to share with Steele a commitment to painstaking execution of the work. It is beautifully done, and double in more than one way (doubly double): it is physically two paintings joined, and one is mirrored in the other along the central diagonal, with the tones and colours reversed. Like the Morris there is spatial ambiguity: the lighter ‘figures’ in one viewing (it shifts) combine to form a ground which I start to interpret as space, almost as sky, as if I am looking up from an enclosed space (with buildings) and some strange thing, an alien vessel perhaps, is descending. Then it shifts again and I know for sure that this illusionistic referential reading is just that, one reading, that I would have to work hard to maintain. What interests me is that my eye/brain seems to want to make sense of it in this way, until the object before me seems to insist that I change my mind. The Gallery information sheet had the lowest two rows of information missing so I don’t know the title of this particular double vision. 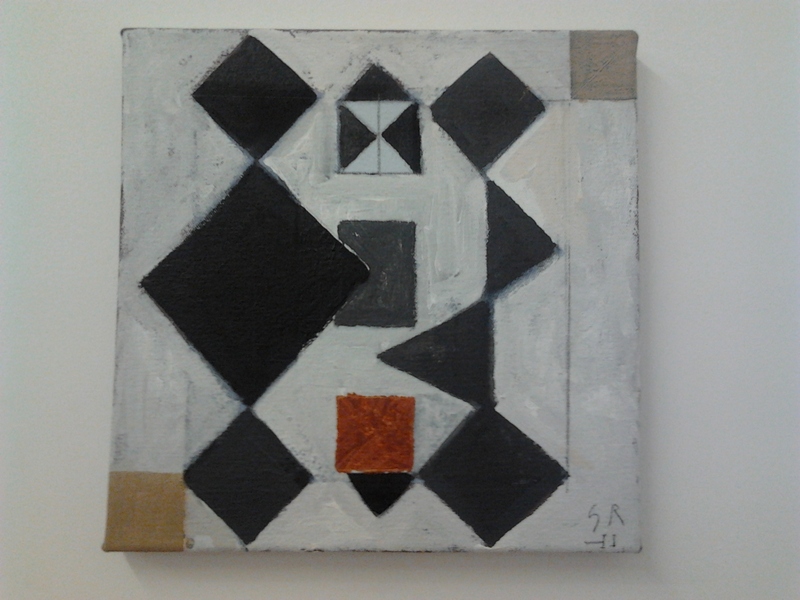 another small piece, higher in colour than many here, with black, which features quite a lot in this show. 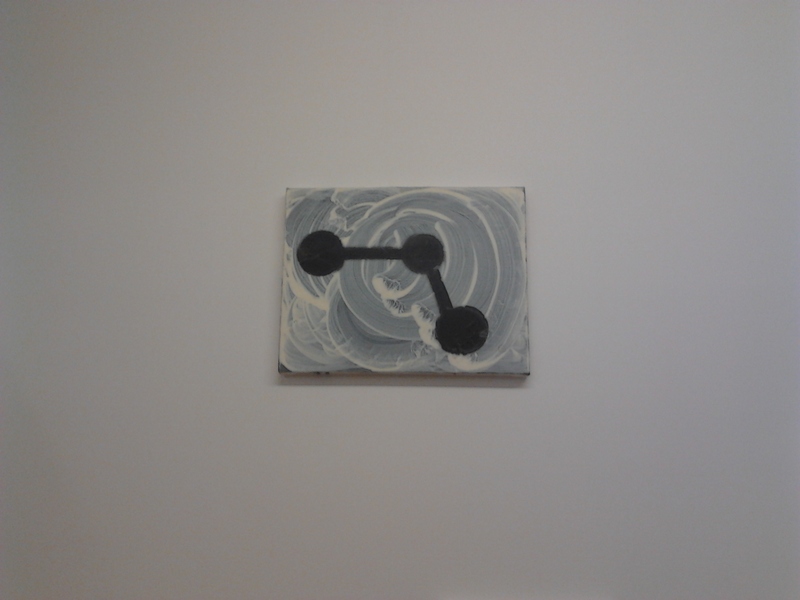 It is years since I saw a John McLean painting in real life (I have been looking at some reproductions recently in a very good book), and seeing this one reminded me that I have half arranged to go and see the one in the collection at the Whitworth. I met him once, when I was an art student and he came to see my work. I remember being mildly embarrassed by his enthusiasm for it, my friend dubbed it “an unqualified rave” McLean exclaiming over and over “this is f***ing ambitious work”. Looking back, I wish I had allowed that feedback from an artist I admire to become more productive in terms of self-confidence, which I lacked in those days. This painting is self-confident, seeming to assert the modernist tradition in abstraction, almost because it is out of fashion. The other artists in this exhibition, and I will post another time about some of their work, are: Chris Baker / Dominic Beattie / Isha Bøhling / Ian Bottle / Alice Browne / Simon Callery / Keith Coventry / Natalie Dower / Tom Hackney / Jumpei Kinoshita / Hannah Knox / Sarah McNulty / Neil Mendock / Jost Münster / Selma Parlour / Geoff Rigden / Dan Roach / Danny Rolph / David Ryan / Estelle Thompson / Julian Wakelin. It’s all good stuff, each work individually, and the exhibition as a whole-different-then-the-sum-of-its-parts, that I hope I get to see again before it closes on 14 July. 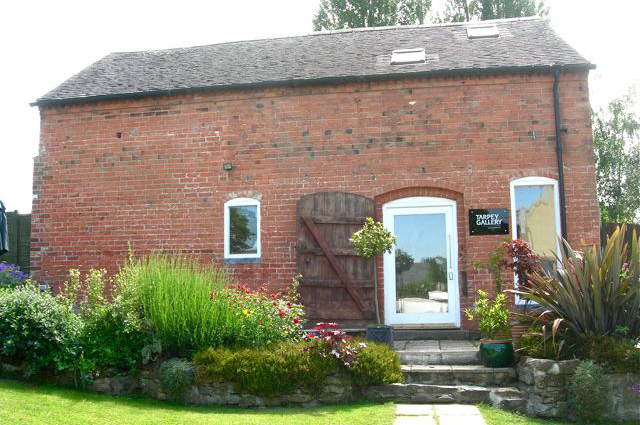 What’s to see in Castle Donington as well as motor racing, Download festival and a historic church building? but hurry! It ends on 20 August. 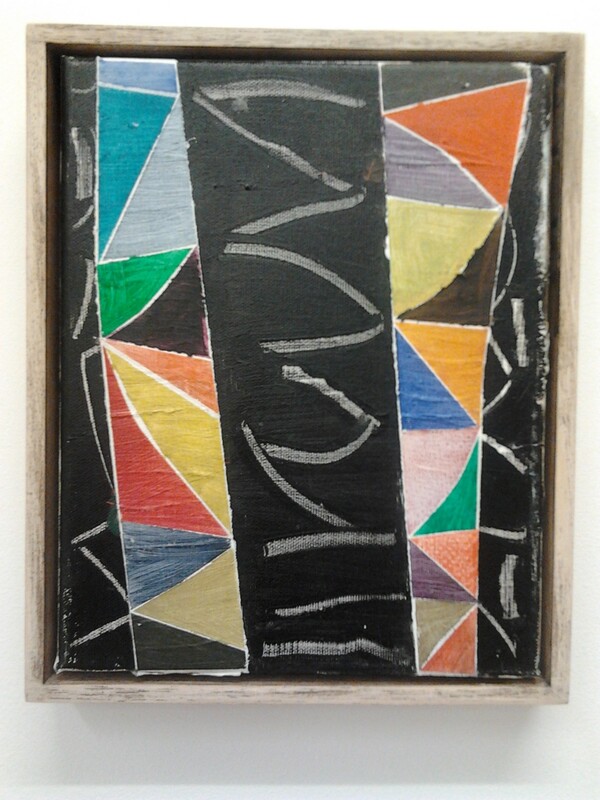 And at last, I find abstract paintings on show not 20 miles away from where I live! I don’t know how I could have missed this contemporary art space, it has been open since 2009, and today was the first I knew of it. (Except that as I look through a number of emails I notice that it has been mentioned to me before , yet somehow it must not have registered). The current show is of paintings by David Manley, entitled From the Earth Wealth. Lots of modestly sized, landscape related abstracts, derived from and named after the settlements of North West Leicestershire. 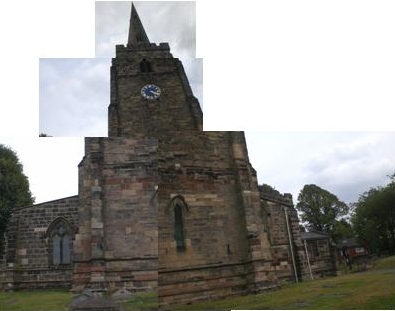 This one, for example, is Diseworth. There may be a sense in which it brings back some experience of Diseworth, there is surely an element of representation. Is it a fence or a gate perhaps, with something propped up against it? And is that a cloud over a field… of sea? If it does represent, what we are seeing is highly generalised and the sense of specific place is lost. Or maybe the representation has dream like qualities, so it’s not so much that particular place as that place half remembered as in a dream. Another option could be that we are dealing here with the very act of representing, and the deletions, generalisations and distortions that naturally take place as part of that process. Or, then again, it could be misleading to think of them as representations at all. They are, in fact abstract. They are so in the sense of “abstracted from”, Leicestershire settlements providing a starting point only. 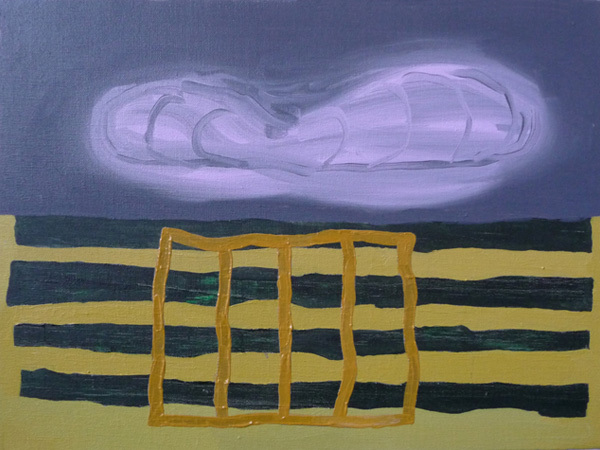 The singularity of each painting has to do with what is happening there on the canvas rather than the singular experience of being in, for example, Hemington. The place names are ‘real’ origins, however. Each painting is based on, “abstracted from”, photographs taken by the artist at that specific location and then digitally manipulated. For me, it’s an interesting way of beginning, that leads then to a manipulation of painted shape and colour that has a lot more to do with early modernist painting, than it has to do with any of the starting points, and arriving at abstract pictures that are wonderfully rewarding to view. Here at Tarpey Gallery in Castle Donington, abstracted from the earth, are a wealth of painted forms for our enjoyment, it’s not too late to go and see them, if you hurry!